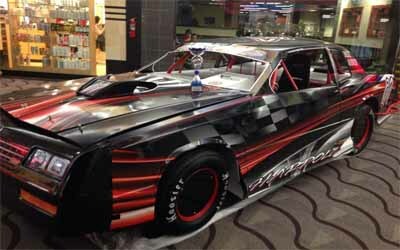 The annual Dacotah Speedway Kirkwood Mall Show was held this week, which means race season is just around the corner! 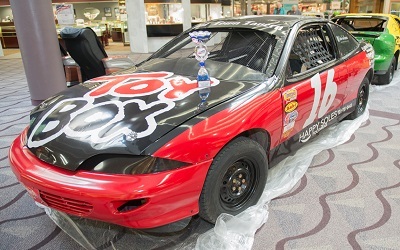 Twenty-nine cars plus a mud drag truck graced the mall to show off all that Dacotah Speedway has to offer. Each division was judged by a panel of judges and winners were chosen, on top of this we had a Facebook Fan Favorite Award which was an overall award given out to the best of the best. This show was extremely hard to judge this year, as the drivers and crews went above and beyond with metal work and graphics. 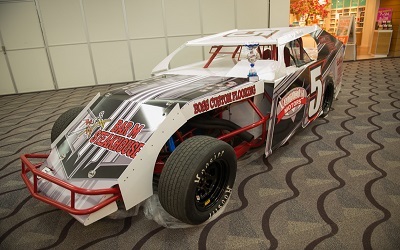 First up is the IMCA Modified Division winner, Larry Magstadt will pilot the #5 car this summer powered by a Ford small block engine, with a car wrapped up in graphics from Studio D Graphix. You wont want to miss this car out on the track screaming by the grandstands! Next on our list is a division of cars that came out in huge numbers to the mall, which means only one thing! We are going to have tons of them on the track this season, and that's fine since the past 2 years our track has held the record of the highest Wissota Street Stock car count in all of Wissota! The winner is Kendall Booke of Dickinson in his Pontiac Grand Prix, Kendall and his dad spent the entire winter taking this car from street legal to track legal! He says ''we just fired up the plasma cutter and went to town'', they spent countless hours after stripping it down measuring and calculating exactly how it should come together. WOW it did! The next division that was up to be judged is the Hobby Stocks, the winner is another familiar face to Dacotah Speedway, always there to help the track or a fellow competitor. Josh Roehrich in the 4D Ford powered machine walked away with his first trophy of the season! 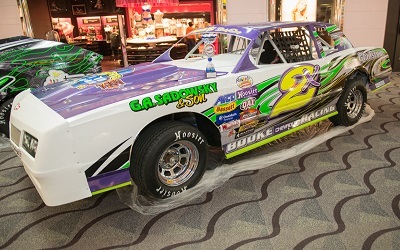 His Ford Hobby Stock and IMCA Sport Compact are wrapped by Studio D Graphix. Here we have one of four brothers that all race in the same division, talk about arguement's at home over who took who out on the track! 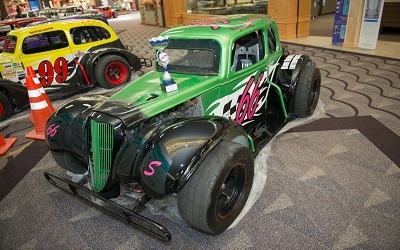 INEX Legend driver Casey Martin in the #66 machine takes home top honors from the mall this year. His car along with his brother's are sponsored by Lady J's Catering. Finally for the divisi on winners is a driver we all know, him and his family put all the effort they can into coming out on Friday nights and having fun. That is what it is all about after all, its not fancy haulers, big money engines, and backup cars. Its about a family doing things together, and they get friends with them to come out and be on the pit crew and do whatever they can to make it an experience! IMCA Sport Compact driver Alex Thompson got a new ride this year, what looks to have been a Chevy Cavalier is now a racing machine! The #16 machine will be tearing it up with the rest of the Sport Compacts this season, and if you want to get into one of these cars they are pretty economical to get into. Stop in the pits and ask these guys, they will give you the into you need to know! We have a winner of the Facebook Fan Award! Congrats to #87 Street Stock of Eric Harpole! He collected 79 total votes or 17% of the voting. The first day it was looking to be close, with #21 and #32 hot on his trail! The 2015 racing season begins on Friday, May 1st. Front gates open at 6 and the green flag flies at 7. Tickets are $11 for 13 and older, 12 and under are free. Advance, discount tickets are available at all Tri Energy Cenex locations in Mandan, Bismarck and Lincoln.